pirates and peonies: oh, my! anyone else panicking about the cold? these days there is no way around getting layered. above are my favorite must haves for fall! hats and scarves and other chunky knits have been great since it isn't quite time for winter jackets. 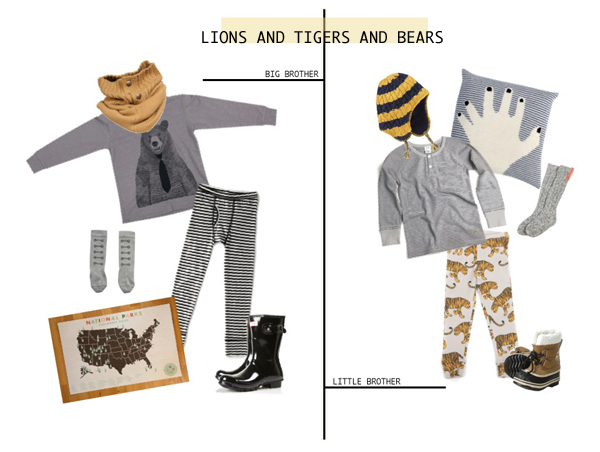 i am loving long underwear as pants for the boys, it makes it easy for them to move (and easy to pinch their little bottoms as they walk by!). please, don't act like you don't do that to your kiddos! i swear they will never be too old for a little squeeze! oh, and i know, i know... here i go again with the stripes!! i can't seem to control myself! they are just so great for layering and simple statements. also, if you have read any of my recent guest posts you know that i have a love for clothing with animals on them. funny thing, my boys will wear anything that contains a furry little friend! win, win. so there you have it - the simple ways we are preparing for endless movie nights and fort making! ...and here is for you mamas, cause i just hate feeling left out! Love those leggings! And I too am into animals right now. Especially little woodland creatures. Thanks for sharing! cute! I love the bear shirt. I love his Quirkiness and your very transparent heart....oh and that rag doll;)! Yep, loving the mama outfit. I've suddenly started wanting to shop for me again!